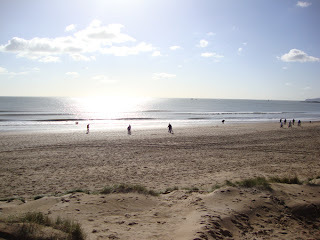 Camber Sands is about ten minutes drive from the cottage. It is site of scientific and geographical interest, and nature conservation, due to it being the only large dune system in East Sussex. It is also a brilliant place to go and and eat sausage sandwiches – as we did a couple of weeks ago! We were lucky enough to be able to bask in, what will probably be, the last really sunny day, for a while. Camber Sands, with its wide bay and large dune system, has been used in many TV programmes and films. In 1962 the beach was used for the D-Day landing scenes in the epic war movie The Longest Day. Carry On Follow That Camel was shot on location here during the early months of 1967 when Camber Sands doubled for the Sahara Desert although filming had to be stopped several times because the dunes were covered in snow! Of course, for Doctor Who fans, it is probably most well known as one of the locations for the final episodes of The Trial of a Time Lord – The Ultimate Foe. See if you can spot where the Sixth Doctor was slowly dragged into the sand! The Doctor Who Locations Guide might help you to find it – it also has some stills from the 1965 story ‘The Chase’ which was also filmed at Camber Sands. This entry was posted in Local Information on May 27, 2015 by admin.